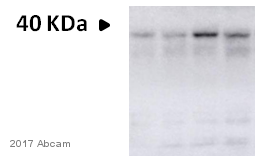 This antibody detects a 42 kDa protein corresponding to the apparent molecular mass of p38a. This peptide sequence is highly conserved in the p38ß,g, and d MAPKs, and is identical in human and mouse p38a. Synthetic peptide corresponding to Rat p38 (phospho T180 + Y182) conjugated to Keyhole Limpet Haemocyanin (KLH). Clone M139 was generated from a phospho-p38α (Thr-180/Tyr-182) synthetic peptide (coupled to KLH) corresponding to amino acid residues around threonine 180 and tyrosine 182 of rat p38α. Pervanadate treated human Jurkat and A431 cells and anisomycin treated human HeLa cells. 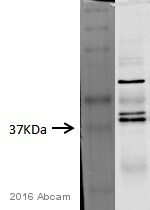 Mouse monoclonal purified with protein A chromatography. Our Abpromise guarantee covers the use of ab45381 in the following tested applications. Whole cell lysates were prepared with RIPA buffer (containing protease inhibitors and sodium orthovanadate), 10μg of each were loaded on the gel and the WB was run under reducing conditions. After transfer the membrane was blocked for an hour using 5% BSA before being incubated with μg /ml and ab8227 at 1/1000 dilution overnight at 4°C. 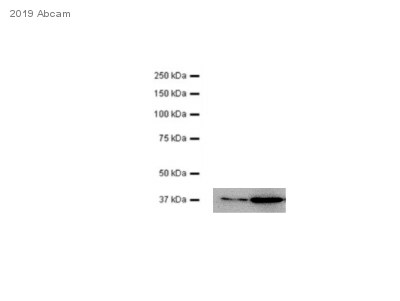 Antibody binding was detected using an anti-mouse antibody conjugated to HRP (ab97040) at 1/10000 and visualised using ECL development solution. Immunofluorescence analysis of pervanadate treated mouse C2C12 cells, staining p38 (phospho T180 + Y182) with ab45381 at 1/250 dilution. Cy3-conjugated anti-mouse IgG was used as the secondary antibody. Publishing research using ab45381? Please let us know so that we can cite the reference in this datasheet. As we discussed over the phone, I requested further information as to the protocol used to produce the Western blot presented on the datasheet of ab31828 and ab45381. I have attached the protocol to this email. In summary, the pervandate treatment (presented in lane 2 and 3 of image on datasheet of ab45381) was performed on living cells for 30 min at 37°C using 1 mM pervanadate (see recipes in protocol). The cells are then lysed using either cold lysis buffer (native) or hot SDS buffer (denatured) that included phosphatase inhibitors (Sodium pervanadate and Sodium Fluoride) to maintain increased tyrosine and threonine phosphorylation during lysis (see recipes in protocol). 25 microliters of control versus pervanadate treated lysates were loaded in a mini gel to get the results shown.